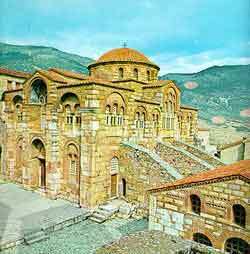 The 11th-century monastery of Hosios Lukas in Greece is representative of the Byzantine art during the rule of Macedonian dynasty. Byzantine architecture is the architecture of the Byzantine empire. The empire emerged gradually after AD 330, when Constantine moved the capital of the Roman empire to Byzantium, which was later renamed Constantinople and is now Istanbul. Early Byzantine architecture is essentially a continuation of Roman architecture. 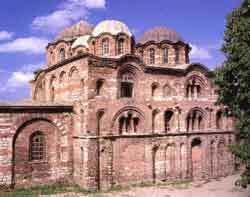 Prime examples survive mostly in Ravenna and Constantinople and include the churches of St Irene, St Sophia, and St Sergius. Secular structures include the walls of Constantinople and Yerebatan Saray. A frieze in the Ostrogothic palace in Ravenna (now S Apollinare Nuovo) depicts an early Byzantine palace. Gradually, a style emerged which was influenced more by the architecture of the near east, and used the Greek cross plan for the church architecture which mostly stands today. Brick replaced stone, classical orders were used more freely, mosaics replaced carved decoration, and complex domes were erected. As early as the building of Constantine's churches in Palestine there were two chief types of plan in use: the basilican, or axial, type, represented by the basilica at the Holy Sepulchre, and the circular, or central, type, represented by the great octagonal church once at Antioch. Those of the latter type we must suppose were nearly always vaulted, for a central dome would seem to furnish their very raison d'etre. The central space was sometimes surrounded by a very thick wall, in which deep recesses, to the interior, were formed, as at the noble church of St George, Salonica (5th century? ), or by a vaulted aisle, as at Sta Costanza, Rome (4th century); or annexes were thrown out from the central space in such a way as to form a cross, in which these additions helped to counterpoise the central vault, as at the mausoleum of Galla Placidia, Ravenna (5th century). The most famous church of this type was that of the Holy Apostles, Constantinople. Vaults appear to have been early applied to the basilican type of plan; for instance, at St Irene, Constantinople (6th century), the long body of the church is covered by two domes. Interior of the Hagia Sophia, showing many features of the grandest Byzantine architecture. At St Sergius, Constantinople, and San Vitale, Ravenna, churches of the central type, the space under the dome was enlarged by having apsidal additions made to the octagon. Finally, at Hagia Sophia (6th century) a combination was made which is perhaps the most remarkable piece of planning ever contrived. A central space of 100 ft (30 m) square is increased to 200 ft (61 m) in length by adding two hemicycles to it to the east and the west; these are again extended by pushing out three minor apses eastward, and two others, one on either side of a straight extension, to the west. This unbroken area, about 260 ft. long, the larger part of which is over 100 ft (30 m) wide, is entirely covered by a system of domical surfaces. Above the conchs of the small apses rise the two great semi-domes which cover the hemicycles, and between these bursts out the vast lome over the central square. On the two sides, to the north and south of the dome, it is supported by vaulted aisles in two storeys which bring the exterior form to a general square. 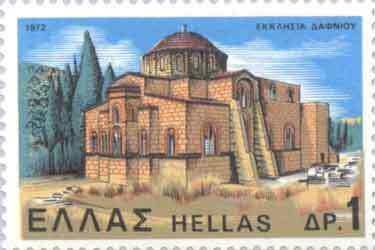 At the Holy Apostles (6th century) five domes were applied to a cruciform plan, that in the midst being the highest. 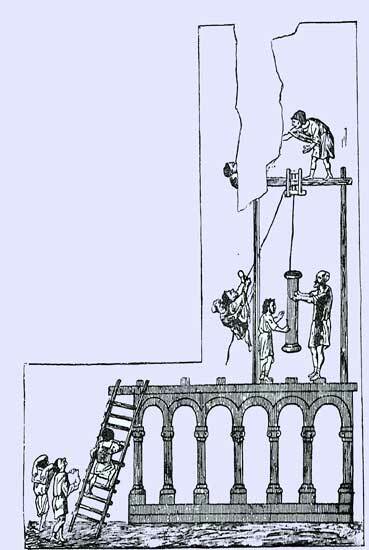 After the 6th century there were no churches built which in any way competed in scale with these great works of Justinian, and the plans more or less tended to approximate to one type. The central area covered by the dome was included in a considerably larger square, of which the four divisions, to the east, west, north and south, were carried up higher in the vaulting and roof system than the four corners, forming in this way a sort of nave and transepts. Sometimes the central space was square, sometimes octagonal, or at least there were eight piers supporting the dome instead of four, and the nave and transepts were narrower in proportion. If we draw a square and divide each side into three so that the middle parts are greater than the others, and then divide the area into nine from these points, we approximate to the typical setting out of a plan of this time. Now add three apses on the east side opening from the three divisions, and opposite to the west put a narrow entrance porch running right across the front. Still in front put a square court. The court is the atrium and usually has a fountain in the middle under a canopy resting on pillars. The entrance porch is the nartliex. The central area covered by the dome is the solea, the place for the choir of singers. Here also stood the ambo. Across the eastern side of the central square was a screen which divided off the bema, where the altar was situated, from the body of the church; this screen, bearing images, is the iconastasis. The altar was protected by a canopy or ciborium resting on pillars. Rows of rising seats around the curve of the apse with the patriarch's throne at the middle eastern point formed the syntironon. The two smaller compartments and apses at the sides of the bema were sacristies, the diaconicon and protozesis. The continuous influence from the East is strangely shown in the fashion of decorating external brick walls of churches built about the 12th century, in which bricks roughly carved into form are set up so as to make bands of ornamentation which it is quite clear are imitated from Cufic writing. This fashion was associated with the disposition of the exterior brick and stone work generally into many varieties of pattern, zig-zags, key-patterns &c.; and, as similar decoration is found in many Persian buildings, it is probable that this custom also was derived from the East. The domes and vaults to the exterior were covered with lead or with tiling of the Roman variety. The window and door frames were of marble. The interior surfaces were adorned all over by mosaics or frescoes in the higher parts of the edifice, and below with incrustations of marble slabs, which were frequently of very beautiful varieties, and disposed so that, although in one surface, the coloring formed a series of large panels. The better marbles were opened out so that the two surfaces produced by the division formed a symmetrical pattern resembling somewhat the marking of skins of beasts. Ultimately, Byzantine architecture in the West gave way to Romanesque and Gothic architecture. In the East it exerted a profound influence on early Islamic architecture, with notable examples including the Ummayad Great Mosque of Damascus and the Dome of the Rock in Jerusalem. In Russia, Romania, and other Orthodox countries the Byzantine architecture persisted even longer, finally giving birth to local schools of architecture. Neo-Byzantine architecture had a small following in the wake of the Neo-Gothic of the nineteenth century. It was developed on a wide-scale basis in Russia by Konstantin Thon and his numerous disciples. Mainstone, Rowland J. (1997). 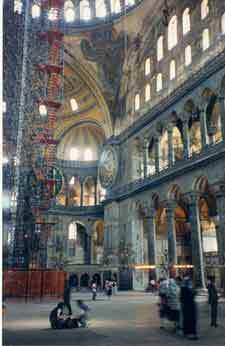 Hagia Sophia: Architecture, Structure, and Liturgy of Justinian's Great Church (reprint edition). W W Norton & Co Inc. ISBN 0500279454.